The first hints of spring in North Carolina begin with a blush on the tree-tips; like an afterthought, or a dry brush technique from Bob Ross. And then, just after the daffodils start opening their buttery yellow blooms, something remarkable starts happening. Before you know it, you spot a burst of white or pink, then a splash of vivid purple. The world explodes into blooms on every tree branch. If you’re like me, you eagerly count down the days until that first walk around the neighborhood in early to mid-spring. My kids have asked me why I like to take the same route again and again, but they don’t get it yet. Living in North Carolina means there’s always something new to see outdoors, even if you walk or hike the same paths over and over again. One of the first, and showiest, of the blossoming spring trees is the Tulip Magnolia. If you happen to spot their enormous, goblet-like blooms, often in vivid pinks and purples, you’ll understand where the tree got its name. They bloom without leaves, so it can be a little surprising to see the massive blooms just hanging out on the edges of the branches. Magnolia liliflora, are not a native species to North Carolina, but came to us by way of Asia, and they now flourish in our moderate climate. They’re considered ornamental trees, and can often be found in botanical gardens or as landscaping features. 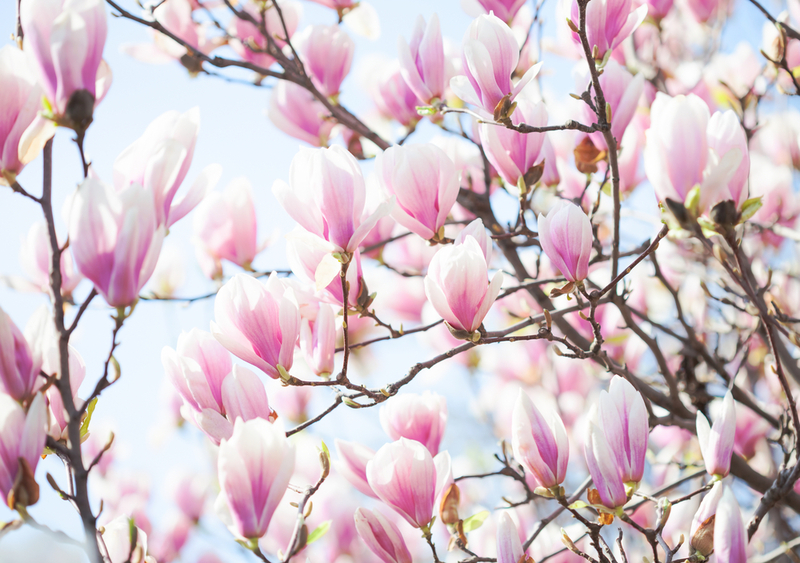 The darkest purple varieties are true Tulip Magnolias, or Mulan trees – those that are larger and pinker are a hybrid, also known as a Saucer Magnolia. Either way, you can’t miss them when you see them. They always make me smile. 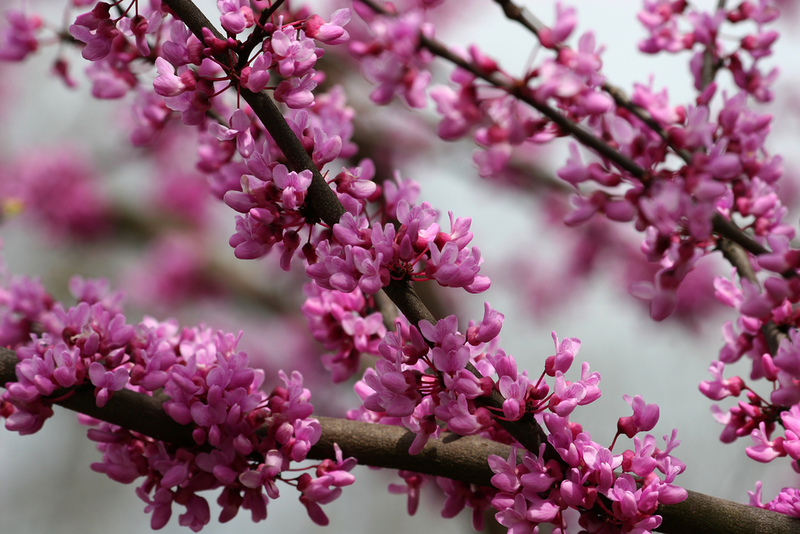 The showy redbud — a native plant you can see in the woods in early spring. 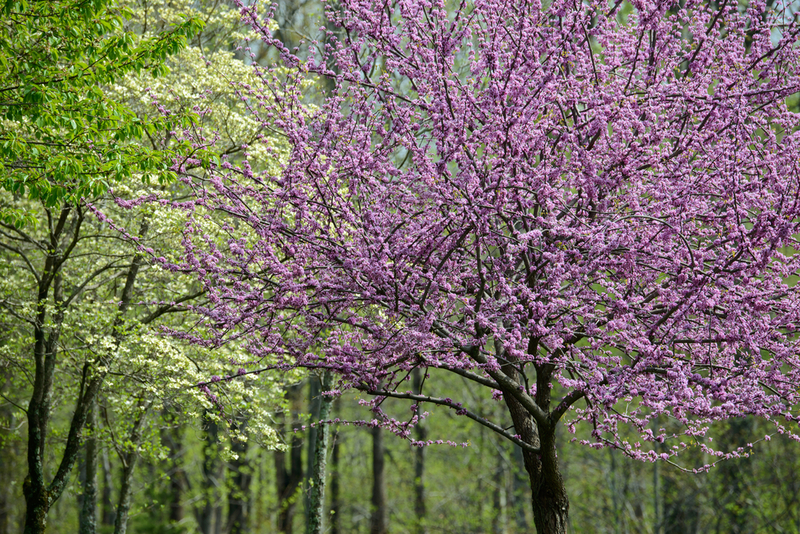 If you’re still in a purple bloom state of mind but want to see a native North Carolina showstopper, then you should make way for the redbud (or Cercis canadensis). In April and May you can spot these small trees arcing over the highways, often intermingled with another purple bloom, the showy wisteria. If you’re adventurous and love hiking like our family does, it’s a welcome sight in the early spring, clusters of blooms all along the branches. As the leaves begin to come out the buds go from dark red to paler purple, and then fade altogether. But they’re a beautiful sight in contrast to the billions of bright green leaves of April and May. You don’t have to go far to see these brilliant blooms, either. They’re common all across the state. Dogwoods often look like pink or white clouds from a distance. Want the best of both worlds? It’s no coincidence that the dogwood is the North Carolina state flower. These bounteous beauties make their showing in mid-spring, and keep their blooms for quite a while. 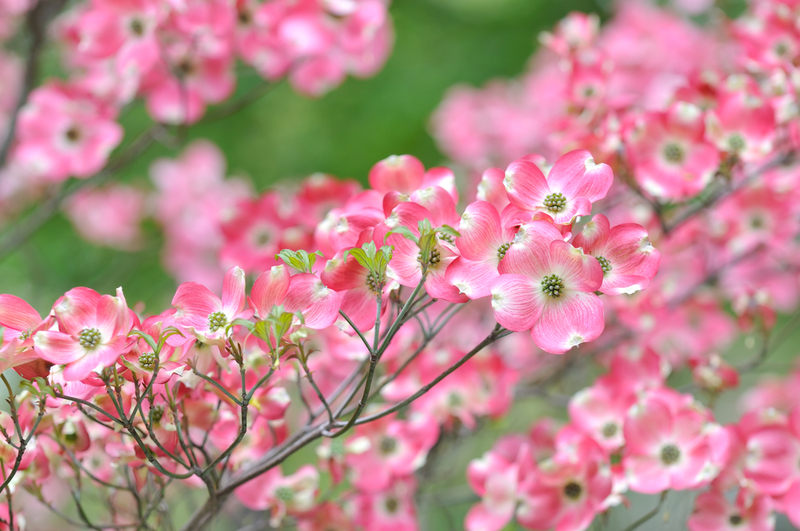 There are dozens of types of dogwoods around the world, but the American South is known for some of the best flowering trees in this family. Most often you see Cornus florida, which comes in both a white petal and a pink petal variety. As a frequent visitor of Mebane, NC, where they hold an annual Dogwood Festival, I can tell you that the contrast of the two is just remarkable. Like the redbud, dogwoods are both native and can be planted as an ornamental tree. So you can see them both in the woods on a quiet afternoon stroll, or down the street. One of the bonuses of the dogwood is that it really is lovely all year round. In the summer it’s a deep green; in the fall, it sheds berries and its leaves turn to a deep burgundy. Aside from the Dogwood Festival in Mebane, you can also visit the one in Fayetteville, too! 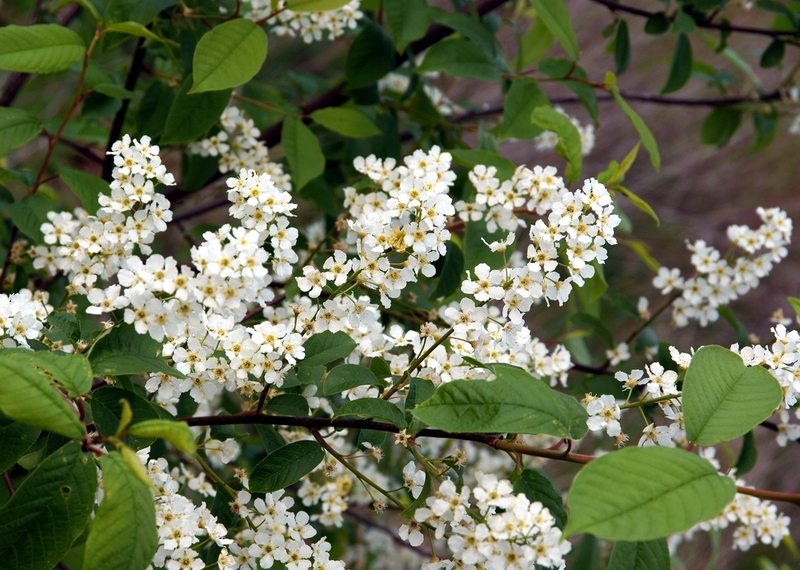 The black cherry, or wild cherry, makes a lovely contrast against broad, green leaves. Next up we’ve got a perennial favorite: the cherry tree. We live in a climate that cherries love, and they provide some of the most lovely, cloudlike blossoms in the spring. Sure, Washington, D.C., might be known for its contribution to the popularity of this tree, but here in NC, we’ve got one that’s even got our name in it: Prunus caroliniana, otherwise known as the Carolina cherry laurel. It’s more prevalent down toward Wilmington, and the blooms are a little different than you might expect, but it’s still a breathtaking sight to see. Another native cherry is the Black Cherry or Wild Cherry, Prunus serotina. The challenge here is that while the fruit is edible and the flowers absolutely lovely, the wilted leaves are seriously poisonous. And finally, we’ve got another blooming fruit plant to share: the pear tree. This tree, often called a Bradford pear, is iconic in terms of ornamental trees in the South. It seems most neighborhoods have a wealth of them. The offspring of those well-mannered ornamental pears are, to put it nicely, aggressive thugs. They spread rapidly with the help of birds dropping their seeds, and the resulting plants are thorny invaders, choking out native wildlife habitat wherever the seedlings take hold. The problem is severe enough that many localities have banned the Bradford pear altogether in certain settings. The good news is that you don’t have to forgo flowers for this common, and rather disappointing, flowering pear. Many of the plants I mentioned earlier make Neill’s list as good alternatives. Mother nature provides, but sometimes she needs a little guiding hand in the right direction. And we’ve just scratched the surface. Flowers and trees, native and cultivated alike, bloom all summer long, and even into the fall. The best way to get to know them is to get outside and take a walk, or a hike, and enjoy the landscape all around you. That’s the best part of spring in North Carolina. Our Mission: To improve the health and well-being of our customers and communities.